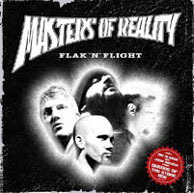 "Flak’n’flight", the new record by the Masters Of Reality is one of the best live albums of the last decade. Chris Goss and John Leamy with help of Nick Oliveri and Josh Homme rocked Europe. E.C. : How did you chose the songs for your new live album "Flak’n’flight"? Chris Goss: We had just a few rehearsals for the tour. What you got on the lp, is what we learned. I wanted to concentrate on newer songs. E.C. : "Flak’n’flight" is your second live album beside only 4 studio albums. Do you feel more comfortable on stage? E.C. : The tracks often sound as if you were jamming around, especially "Rabbit one" & many of the intros. Was this an approach you used? E.C. : You cover the Ramones song "Cretin hop". What means their music to you? E.C. : How many shows did you do on the European tour? E.C. : What was the worst experince during that time? E.C. : You are too involved in the success of the Queens Of The Stone Age. What do you think triggered that success? E.C. : What role do you play for Nick Oliveri and Josh Homme? E.C. : How much has this lose group of friends really become a movement? Chris Goss: It seems to be growing. I'm hearing our influence everywhere now. But as far as being a structured art movement as perhaps the bauhaus painters and designers, we're too stupid and unorganized for that. By the way, Paul Klee is my favorite painter. E.C. : How did the Desert Sessions (Compilation series including Josh Home, Chris Goss, Nick Oliveri, Mark Lanegan, Chris Cornell Band and many others) start? Chris Goss: Josh Homme taping quick songs with his desert friends. Just for fun. E.C. : How do the recordings work for this sessions? E.C. : Is the so called Stoner Rock scene really existing or just a thing of the press? Chris Goss: It's a press term. We just call it music. E.C. : On what projects do you work at the moment? Chris Goss: Finishing producing Melissa auf der Maur Lp. and finishing Mark Lanegan lp. Recording tracks with Twiggy Ramirez for our new band called Snowballs. it is me, Twiggy, and drummer -Zach Zill. It's rock music. Twiggy and I both sing. E.C. : Since some time there are rumors of an Chris Goss solo album. How far is it?